Perfect for the knitting or crocheter Wizard on your holiday list. 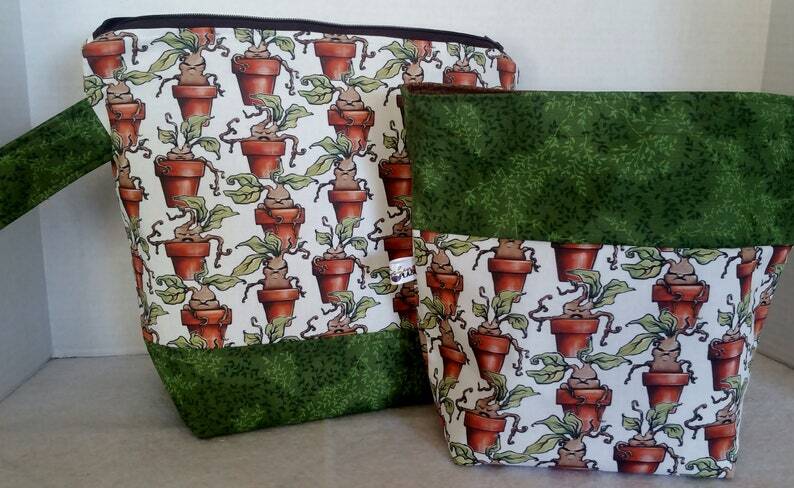 You can never have too many storage or project bag and these are just so handy for any project you might have! This bag is roomy with its large boxed bottom and can easily handle a pattern wallet, all of the needles and hooks you need, and notion bags. It is easy to pop in your project, pull it closed, and off you go! •	Ideal for small to medium size projects like socks, shawls, and hats. Items are made in a pet friendly and smoke free home. Yarn and notions shown in certain photos are for demonstration purposes only and not included in the purchase of a project bag. This is a stock photo, The placement of the fabric may vary from each handmade bag to another.